Posted January 30, 2019 by Mitch Hitch & filed under Featured Inner West Independent, Inner West Independent. 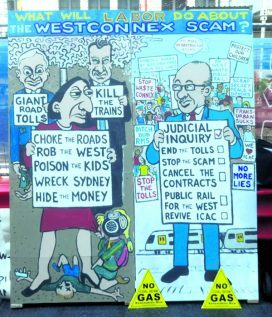 If the ALP is interested in winning the respect of the Inner West community – a respect that they’ve lost due to their appalling past performance in relation to the provision of public transport and because of their support for WestConnex – then there are seven key initiatives that they should give serious consideration to in the run-up to the State and Federal elections. The most important of these is to come out in opposition to Stage 3 of WestConnex and agree to tear up the contracts before any more money is wasted, and to explain what they mean by “sovereign risk”. Next is to give an ironclad guarantee that under no circumstance will the Western Harbour Tunnel (WHT) ever proceed under a Labor Government. The third is to buy back the WHT “spurs” that have already been approved and contracted out as part of Stage 3; these “spurs” comprise about 40% of the WHT, stopping only at the postal border between Balmain and Rozelle, which is about halfway along the peninsula. To undertake – when the NSW ALP is elected – to immediately remove all of the tolls from the M4. Then to alter the existing Stage 1, 2 and 3 contracts so as to place the onus of proof – in relation to structural damage attributed by home owners to WestConnex – back on the contractor; meaning that the ALP must insist that the tunnel builders prove, beyond a reasonable doubt, that the tunnelling was not responsible for the damage; and also to ensure that the existing tunnels stacks are filtered. To agree to install a public transport option in the existing tunnels – either trains, light rail or non-polluting electric powered buses. And finally, to agree to set up a Royal Commission into NSW Infrastructure Planning and Delivery, with wide-ranging powers to investigate transport infrastructure in particular. With the once blue-ribbon ALP State seats of Balmain and Newtown safely in the hands of two of the only three parliamentarians in the NSW Legislative Assembly who are indefatigable and articulate critics of WestConnex, it’s now time to turn the attention of the electorate to the Federal seats of Sydney and Grayndler. In spite of their professed concerns about WestConnex, which surfaces when addressing locals, neither of the two high-profile incumbent representatives – Tanya Plibersek and Anthony Albanese – both of whom are aspirants to the highest office in the land, have made any headway in convincing their Federal ALP cohorts that WestConnex is a real dog of a project and that it will undoubtedly create traffic chaos in the Inner West on an unimaginable scale, ultimately leading to a severe backlash at the ballot box, if not in this Federal election, then certainly at the next. Are they vulnerable? Could the unthinkable happen and the ALP actually lose one or both of their seats, seats that are the really big diamonds in the Labor crown? If they did, it could only happen off the back of their support for WestConnex, directly attributable to the State and Federal Branches of the ALP blithely ignoring the widespread community opposition, ill-will and anger that this infrastructure dog has unleashed. The Federal Branch of the ALP is focussed on winning in Western Sydney, while assuming that all’s quiet on the Inner Western front. Could Greens steal ALP crown? But could a huge WestConnex protest vote possibly allow the Greens to steal a march and pull the rug out from under the pair of them? Now wouldn’t that be a hell of a shock! Unless WestConnex is reversed and the tunnels repurposed for public transport, arterial congestion in the Inner West will result in the sort of bottleneck presently experienced in LA, with six-hourly morning and evening peak hours. Both major parties have also seriously underestimated the genuine and deeply felt concerns of the community in relation to the lethal health impacts of the unfiltered exhaust stacks. So keep Saturday 9 February free between 3:30 and 4:30 pm for a trip to the Birchgrove Tennis Courts. Ask the NSW Shadow Minister for Transport Jodi McKay to explain why she and the ALP support the M4 – M5 Link, the Rozelle Interchange, the Iron Cove Tunnel and the four unfiltered exhaust stacks in Rozelle, but oppose the Western Harbour Tunnel. If you come away from that meeting feeling both frustrated and more than a little disillusioned with the state of politics here in NSW, then keep Sunday 3 March free between 1 and 3 pm for the Fix NSW rally in Hyde Park North. There is so much that needs to be put right here in NSW. It’s now up to the community to lead the way.